Operating a bakery can be sticky business at the best of times. Luckily Capital Insurance Brokers can help take some of the pressure off, leaving you the time and focus to grow your business. 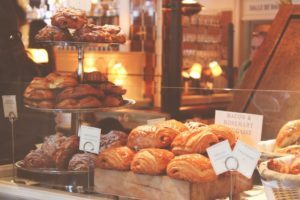 Whether you are starting a new venture, or you have owned a bakery for many years, all bakers can benefit from comprehensive commercial insurance coverage. Having proper coverage will protect you and your business from any unforeseen circumstances you may encounter along the way. In any sort of bakery, there are a countless number of incidents that can occur. From major incidents such as a fire, to more common occurrences such as slips and falls, or equipment issues, it’s important to be sure you’re covered. Property protection: In the event of a fire, or equipment malfunction, you need to ensure that the contents and the property are insured so that you can get back up and running. Injuries: With hot ovens and sharp utensils, bakeries are a prime location for injuries. Of course, don’t forget the possibility of a customer slipping on a wet floor either. Accidents can and do happen, despite all the time and effort that goes into prevention. Being sure that you have a sufficient amount of liability available in case the worst happens can save you a major headache in the future. Theft: Bakery equipment is expensive and difficult to hide, making it an alluring target for thieves. You need to be sure that in the event your equipment is stolen you have the means to replace it and get the bakery up and running again. Commercial general liability: General liability protects your business from any damages you are held legally liable for. It provides coverage in situations where you are held negligent for property damage or bodily harm. Product liability: This coverage applies to the products you make in the event that they have harmed someone of something. For example, product liability would help protect you from accrued financial damages if someone claimed that one of your pastries made them sick. Business interruption coverage: Regardless of how well you’re covered, some losses may prevent you from opening your bakery, at least temporarily anyways. Business interruption coverage can help by covering loss of income and business expenses if you cannot resume normal operations. Equipment insurance: As stated above, bakery equipment can be expensive. Equipment insurance covers you in the event that you need to replace or repair that equipment, saving you some major out-of-pocket costs. Don’t let insurance be one more thing on your mind. Request a bakery insurance quote from Capital Insurance Brokers today!